Australia is a dangerous place. According to my extensive research literally everything is trying to kill you. But sometimes even the deadliest wildlife on the planet needs a lesson in manners. A video has emerged, from what appears to be a hunting trip in the Australian Outback, showing a kangaroo strangling a dog. Which is just a bit much. Admittedly the video begins with the marsupial already assaulting the hound, so it’s hard to know who started the fight. But strangling a dog just seems unsportsmanlike – dogs don’t even have arms so they can’t strangle back. Luckily the dog’s owner has a much more just view of how to conduct unarmed combat and dashes over to square off against the kangaroo. With their gigantic feet, these ‘boomers’ deliver kicks that can crush bone… and even kill their opponents. 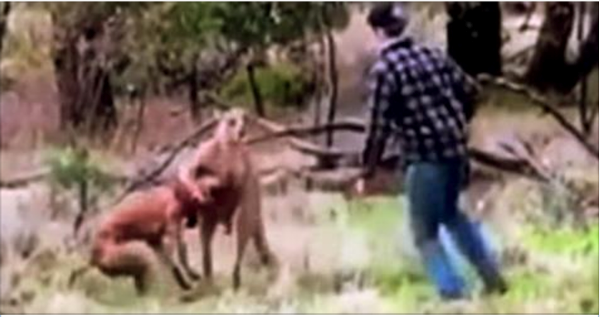 Fortunately, the kangaroo releases the dog as the man approaches and the two square-off in fighting stances. The plucky hunter punches first and lands a solid blow to the roo’s jaw sending him recoiling. This is where I expected the kangaroo to go full savage. But fortunately the person filming this incredible encounter calls out; “let it go, let’s go,” snapping the suicidal hunter to his senses. He beats a hasty retreat, dog and internal organs intact, presumably to tell everyone ever that he just punched a kangaroo and lived to tell the tale.